Arsenal have reportedly revived their interest in signing Paris Saint-Germain midfielder Christopher Nkunku after missing out on his signature in January. 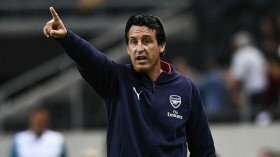 Gunners boss Unai Emery had been keen on pursuing a loan deal for the Frenchman during the winter transfer window but Les Parisiens decided against sanctioning the move. The north London side went on to secure the services of Denis Suarez from Barcelona instead on a short-term loan but the Spaniard has failed to prove his credentials to the backroom team. According to The Sun, the Gunners are now back in the hunt for Nkunku with representatives from the club said to be keeping a close eye on his proceedings ahead of a summer move. Nkunku has largely been a squad player at Parc des Princes with just 10 league starts and Emery is hoping to lure him to the Emirates with the opportunity to earn more gametime. NKunku will be entering the final year of his contract this summer.